In honor of the looming Papal Conclave, this post is dedicated to those two great Italian staples – Mozzarella and Parmesan. 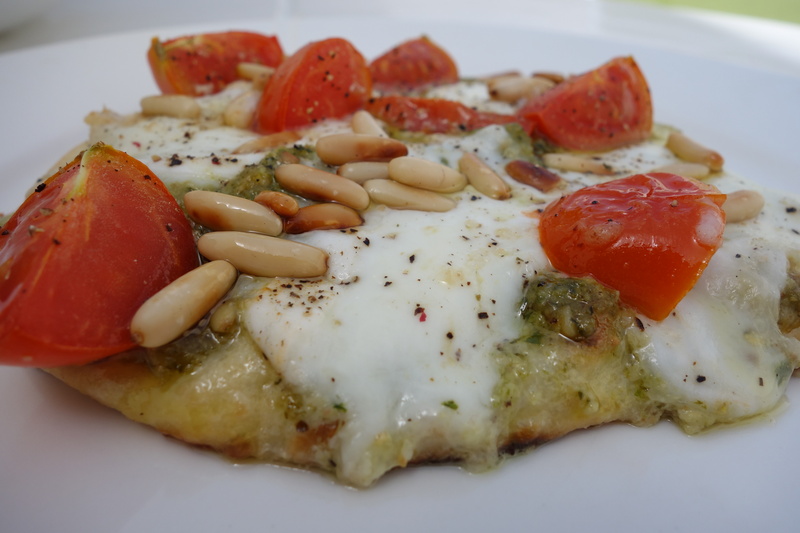 Mozzarella has to be one of the most abuse cheeses in the world – how many of us have had bad mozza on a pizza or in a ubiquitous “Caprese Salad” (usually served at a Baltic temperature). I like my Mozzarella white and of the Buffalo kind and I found this fairly good interpretation in the dairy cabinet at my local supermarket. While not exactly fresh, it was creamy and the perfect addition to my grand Italian plan. Friends know that I have somehow rediscovered or unearthed my latent gardening tendencies and have created my own herb garden on my terrace. 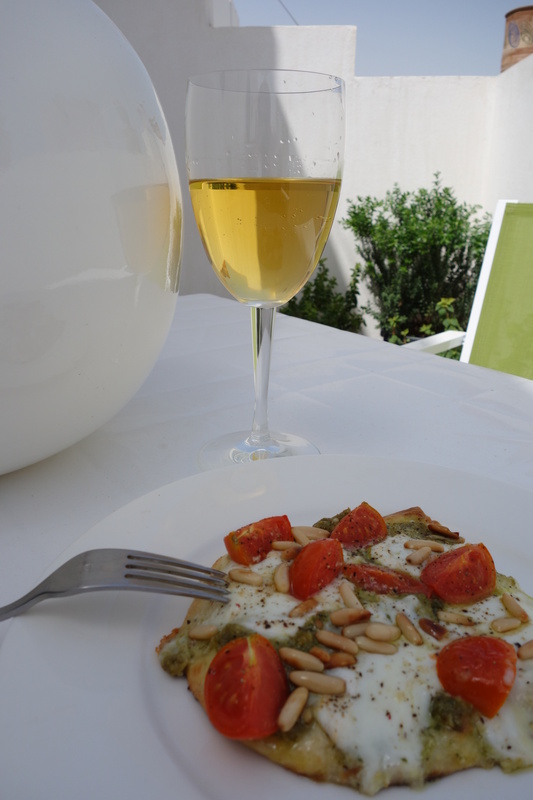 While fending off an ant invasion, my basil has come up rather well, so I wanted to create a Mediterranean lunch. Using some fresh parmesan (lovely and bitey) and the basil, I made a quick pesto using toasted pine nut and Lebanese olive oil. Being the lazy cook I am, I repurposed some previously bought flatbread and created this little pizza. The Mozzarella was just the right amount of creaminess and the Parmesan sharp enough for a store bought product. For the sake of full disclosure, the “wine” in the glass in the photos is actually apple juice. You see, it’s Lent and as part of my half-arsed yearly guilted up observation, I have decided not to drink at home. 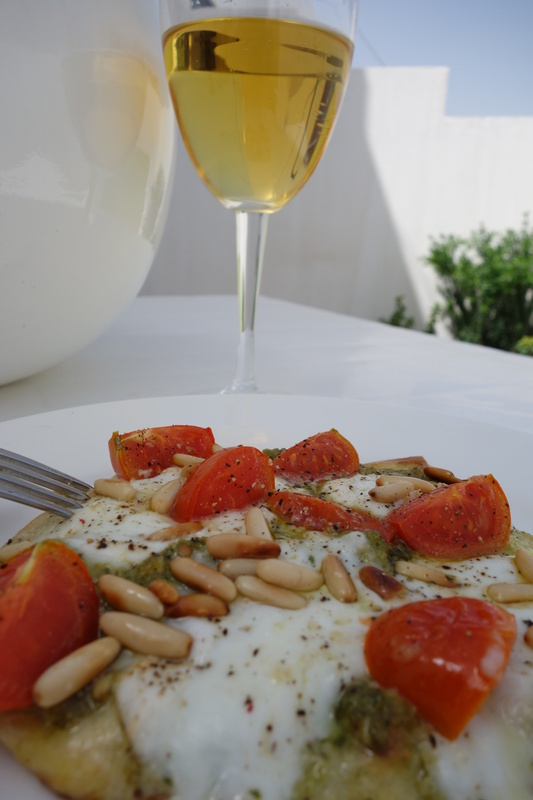 There is nothing like a fresh buffalo mozzarella, delicious tomatoes and a splash of olive oil…I want it now.